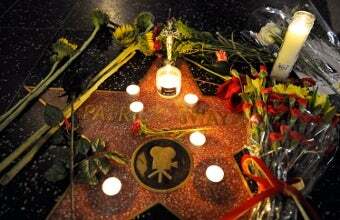 Is There Really A Celebrity Death Trend? R.I.P., Patrick Swayze. And Michael Jackson. And John Hughes. And Farrah Fawcett. And Walter Cronkite. When you put it that way, it sounds like a lot — but has there really been a noteworthy uptick in celebrity deaths this summer? Since the news of Swayze's passing hit Twitter last night, I've seen a ton of people reiterating a sentiment that's been floating around at least since Jackson and Fawcett went within 24 hours of each other: 2009 is the year of shocking celebrity deaths! Michael, Farrah, Walter, John, Patrick. Jim Carroll. Dominick Dunne. Gidget the Taco Bell dog. It's as though some cruel virus is making its way through Celebrityland, robbing us of our icons. In 2008, for example, we lost Studs Terkel, in his nineties, like Cronkite; Paul Newman at 83, like Dunne; Michael Crichton of cancer in his sixties, like Fawcett; Tim Russert of a heart attack in his late fifties, like Hughes and Carroll; Bernie Mac unexpectedly at age 50, like Jackson; not to mention Jeff Healey and Brad Renfro, respectively far too young and far, far too young. Beloved Golden Girl Bea Arthur died in 2009 — and beloved Golden Girl Estelle Getty died in 2008. So what's the big deal about this year? I can't help thinking all the claims that 2009 is somehow unusual, celebrity deathwise, are about as scientifically valid as those e-mails pointing out the "shocking" similarities between Abraham Lincoln and John F. Kennedy. (Both were succeeded by southerners! Both have 15 letters in their names!) And yet, my Twitter feed is once again clogged with statements like, "The Summer of Death continues." I suppose the "summer" point is fair, even if it's nearly fall; we've lost a lot of big names in a fairly short time period. But I think a more salient point was expressed in a tweet by Salon's Mary Elizabeth Williams: "Man, it's like the eighties just keeps dying." Right after my mom died, when I was 25, my shrink made a comment I still haven't quite forgiven her for: "You're at the age when people start losing their parents." That was the last thing I wanted to hear at the time — my grief was special, dammit! It was nothing so pedestrian as the natural consequence of getting older! But however much I resented hearing it, she was right. And now, I have to say this: Internet, you're at the age when people start losing their childhood icons. Well, not all of you. But a whole lot of the people writing obituaries, trend pieces, and maudlin tweets these days. When the news of Hughes's death broke, the Broadsheet e-mail list was almost instantly abuzz with memorial commentary — from me, Williams, Sarah Hepola, Lynn Harris and Amy Benfer, all of us born somewhere between 1965 and 1975. The younger Broadsheeters were silent — much as I was every time I heard one of my parents say, "Oh no! So and so died!" while I was growing up. Who? I'm supposed to care why? Just as Russert's untimely death received head-of-state-style coverage because so many journalists knew him personally, the deaths of Jackson, Fawcett, Hughes, and Swayze, in particular, seem unusually newsy because so many of us charged with writing about them are in our thirties and forties, with fond memories of the lost celebrities going back to our childhoods. I mean, I'm not trying to downplay the global impact of The King of Pop here — or even Johnny Castle, rest his soul — but I find it troubling that their deaths are being cast as part of some bizarre pattern, which is then expanded to include the likes of Cronkite and Dunne, on whom our generation has no particular claim. The only pattern here is that people die — and a lot of us have finally gotten old enough to "know" and really miss the ones who do. The older we get, the more we recognize the names of the dead, the more we recall first seeing them on screen, the more we have to say about the meaning of their absence — and the more every season, every year, will feel like it deserves an "...of Death" title. That's not a new trend. It's just what happens when you're lucky enough to keep living.